High-end style without high-end costs — that’s what you’ll get with a Heritage Slate roof from Golden West Exteriors. Whether you are re-roofing or putting a roof on your brand new home, you can’t go wrong with this Euroshield roof. Ultralight, but not light on performance, your roof will take anything Mother Nature can throw at it. It will be virtually maintenance free and impervious to snow, rain, hail, mold, and anything else that a traditional slate roof might be subject to. 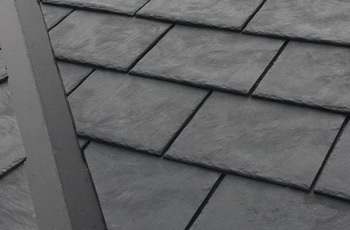 Traditional slate roofs can really break the bank. Installation takes a very long time and can only be done in ideal weather conditions. Slate roofs are heavy and difficult to install, so if you aren’t 100 percent confident in your roofer’s qualifications, you could be setting yourself up for problems down the road. Be sure you are working with a Euroshield Certified Contractor, like Golden West Exteriors. If you aren’t, you run the risk of poor installation voiding your warranty. Only a certified roofer knows the ins-and-outs of re-roofing or installing a new roof with a rubber roof. There are several processes that are specific to the rubber-roof installation processes, and if they aren’t followed, you may end up with improper ventilation, an improperly installed underlayment, or an improperly fastened roof. Give Golden West Exteriors in Edmonton a call. We’ve been professional, trusted Alberta roofers for more than a decade. There are a number of reasons we’ve been able to build such a successful business, including a commitment to outstanding customer service, the highest level of craftsmanship, and a promise to always stand behind our work. Our pros are standing by to answer questions. Schedule an in-home consultation, and let’s discuss your project. We look forward to working with you.